Peter Leithart is a prolific writer, and this typically necessitates that one be a prolific reader, as well. He often shares insights from his current reads over at First Things, and there was an example of this Friday (Dec. 6) where he shared thoughts on Andrew Louth’s Introducing Eastern Orthodox Theology (IVP/SPCK 2013). In this particular entry, Leithart offers brief commentary in response to Louth’s apparent advocacy of Sophiology. Sophiology—from the Greek Σοφια or “wisdom”—is a doctrinal distinctive unique to the Russian émigré philosophers and theologians of the early-20th century; e.g. Sergius Bulgakov, Vladimir Solovyov, and Pavel Florensky, to name just a few. Sophiology has been categorized as erroneous doctrine by both the Moscow Patriarchate and the (then) Russian Church Abroad (ROCOR, ca. 1935). St. John Maximovitch of San Francisco, in The Orthodox Veneration of the Mother of God, categorizes this viewpoint as a heresy on par with Nestorianism (p. 40). Obviously, these are serious charges. But has Leithart adequately represented both Louth and the Orthodox Church on this issue? But you can get everything Louth says you get from Sophia without positing Sophia, and the intuition that he claims leads to Sophiology seems to rest on an elementary mistake: God isn’t “in opposition to creation” because God is both within and outside, filling and embracing creation simultaneously. The Father holds creation in the “two hands” of His Son and Spirit. Or, to borrow from John Frame: God’s transcendence, rightly understood, is not in opposition to His immanence; rather, God is everywhere near precisely because He transcends all created limitations – immanent because transcendent. Why does God need a face other than that of the Son, the image of the Father, to face creation? Why need for anything other than the Spirit’s presence and operation to say that creation is “graced”? When [sic] need is there of a metaxu? Why can [sic] the Spirit be the “between”? In other words, Louth says exactly what Leithart says above, even as Leithart implicates Louth (and Orthodoxy) with Sophiology. Leithart responds “you can get everything Louth says you get from Sophia without positing Sophia,” while Louth himself says (of Bulgakov/Sophiology), “everything he wants to say using the notion of divine Sophia could be said just as adequately without invoking the notion of Wisdom or Sophia.” In fact, Bulgakov himself has done so in his The Orthodox Church, a detail Leithart fails to mention. Again, the purpose of Louth’s book—adapted from a series of lectures—is to provide a critical and succinct introduction to the theological distinctives of Orthodoxy for those in the modern, theological world. Since Sophiology has had an impact in the last century of Orthodox thought, it is only reasonable that he would dedicate a mere three pages to it in a book that covers so much more. As an aside, by rejecting the essence/energies distinction (as far as the Church properly understands it), Leithart is forced to conceive of both transcendence and immanence in practically identical terms. This results in not only a misunderstanding of Orthodoxy and many of the Greek fathers, but also a misrepresentation of both Louth and Orthodoxy in his reflections on the present subject. In this case, a failure to embrace paradox leads to an advocacy of something less-than-orthodox with regards to the Holy Trinity. 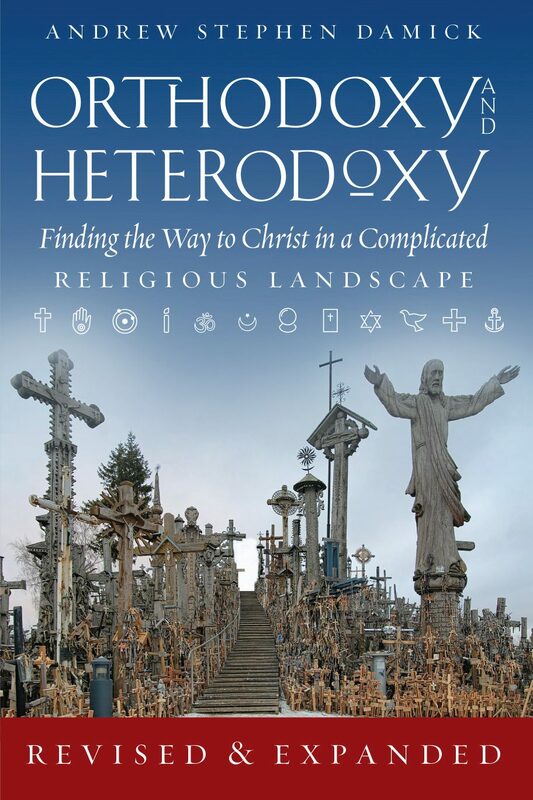 Returning to Leithart and his comments, then: disagree with Orthodoxy if one wants, but at least do so in a way that represents the actual beliefs of Orthodoxy. Tearing apart exceptions to the rule or examples of contrary thought is not dealing with Orthodoxy itself. When representing the beliefs of others, one should do so both adequately and accurately—context always matters. I think it’s unfortunate that Leithart has misrepresented both Orthodoxy and Louth in his post, and it’s something he (or First Things) should consider retracting—if for no other reason, than for the sake of both charity and intellectual honesty. One point that’s worth making is that for Bulgakov, Sophia isn’t a *face* of God, but, is (to use the same analogy) more like a body of God. (I take it, in some sense, that’s true of the energies as well.) In this respect: When Jesus was born, we saw the *face* of God. What more can be revealed of God at the Second Coming? The distinction between the first coming and the second coming is that in the second coming, He comes *with Glory*. This glory is Divine, and is of his hypostasis, but it isn’t a “face”, since it isn’t a hypostasis. Leithart’s comment is a bit slippery w/r/t energies/essence as he says “(some) Orthodox uses of the energies/essence distinction, seems to me to arise from a less than fully Trinitarian theology.” So the ‘some’ gives him wiggle room, but even so, it’s not clear exactly what sorts of things he’s talking about, other than the non-Orthodox doctrine of Sophiology. As an enquirer into Orthodoxy, Sophiology is something new to me. But as I read more on Orthodoxwiki, it sounds similar to the international Catholic movement, Vox Populi Mariae Mediatrici, which is seeking to encourage the papal definition of the Blessed Virgin Mary as “Co-redemptrix, Mediatrix of all graces, and Advocate.” Does anyone else see the similarity, or are they really quite different and only semantically similar? I find it interesting (and encouraging to an inquirer) that Sophiology seems to be universally condemned in Orthodox circles, whereas the movement to declare Mary as “Co-redemptrix” seems to be acceptable by many in the Catholic hierarchy and is picking up momentum. Let’s remember that the Russian Orthodox Church Abroad, the 20th century beacon of Orthodoxy condemned Bulgakovsopinions as heretical. A Decision of the Bishops’ Council of the Russian Orthodox Church Abroad of the 17/30 October 1935 concerning the new teaching of Archpriest Sergei Bulgakov on Sophia, the Wisdom of God. “i) To recognize the teaching of Archpriest Sergei Bulgakov on Sophia the Wisdom of God as heretical. ii) To inform Metropolitan Yevlogy of this Decision of the Council and to request that he admonish Archpriest Bulgakov with the intention of prompting him to publicly renounce his heretical teaching concerning Sophia and to make a report about the consequences of such admonition to the Synod of Bishops of the Russian Orthodox Church Abroad. So it’s a dead issue. Peter J Leithart is Dean of New Saint Andrew’s College in Moscow, Idaho, affiliated with The Transnational Association of Christian Colleges and Schools. Note: whatever that august institution might be today, it is not the same as it was yesterday (nor indeed, what it will be tomorrow). The End of Protestantism (November 8, 2013). Forgive me, but this sounds awfully like a man trying to make his way through a crowded market place to meet his Saviour — the incarnate Logos. (Thanks for heading this post up with Nesterov’s Bulgakov and Florensky — most apt!). I often wonder whether Leithart indulges in these gross mischaracterizations in order to substantiate his bizarre mythology regarding the differences between Protestantism and Catholicism or Orthodoxy. This way he has a reason to remain outside those traditions whilst maintaining a sort of crypto-Catholicsm and crypto-Orthodoxy. In order words, it’s a lie that he unwittingly tells himself. Can anybody tell me the title of the painting used at the top. I know it’s Bulgakov and Florensky but I don’t know the title. 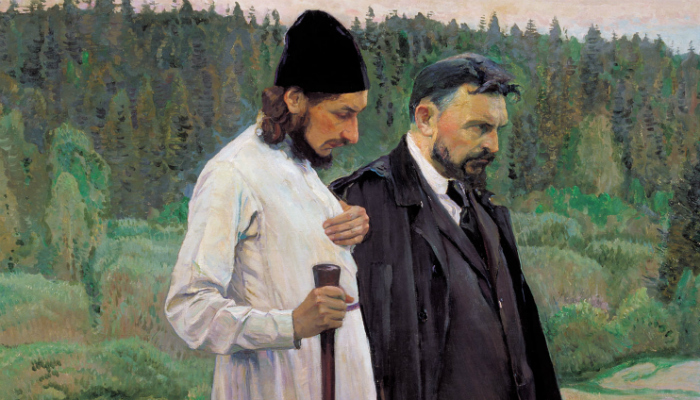 The title is simply Философы (Philosophers), painted by Mikhail Nesterov. ….you mean aside from the fact that the stated intellectual ideal is a practical impossibility. It is only odd that any one thinks it possible. The standard is a delusion of academe. Facts change with context. It is simply impossible to represent a context of which one is not a part. The best that can be done is a brief suspension of disbelief out of charity. One’s own context will always prevail. That is why propositional truth is always a darkened glass. Only in the fullness of His presence is Truth known. We owe to each other to declare when something grossly mistrpresents another’s context. We owe it to each other to listen. It is a stretch to call such misrepresentation lies however.